One is Andersonville. It’s a north side neighborhood. Its borders run roughly from Broadway on the east to Ashland on the west, and from Foster to Peterson/Ridge at its north end. In terms of geography, it’s an unremarkable neighborhood – no close CTA stop or Metra stop, no rivers or remarkable parks, and one main bus (the perpetually crowded and slow 22 Clark) running down Clark Street, its main thoroughfare. The second is my current hood: the West Loop. Or as I like to call it, WeLo. The Bartelme Park at Monroe and Peoria is an entire city block of amazingness. And WeLo is also known for “Restaurant Row” on its northern end. But for all the amazing things happening in WeLo, it still hasn’t reached that point of coalescence as a neighborhood. Andersonville, on the other hand, is the textbook definition of a neighborhood, and all the pluses of one: tight community ties and people filling its shops, stores and restaurants. Why isn’t WeLo every bit as cozy and inviting as Andersonville? I’ve wondered why for a while – and figured I’d try to use some urban planning ideas and metrics to compare and contrast these two areas. In yesterday’s post I talked about the Uptown Theater project in Chicago’s Uptown neighborhood, and how that stood as a symbol of the neighborhood’s illustrious past and current challenges (as well as future potential). It’s amazing to me that such a grand building would sit empty – or that it was ever a candidate for demolition. I feel the same about a building I’ve just discovered in the last few months. I’m finishing my coursework at my new college in the western suburbs, and I take the Metra West Line train every day to get to campus. And as I’d come back into the city, I was mesmerized by a building I’d see from the train. It was clearly a building no longer in use, covered in graffiti and with most of its windows gone. But the shell of the building looked magnificent. It’s been a year and a half since Oprah Winfrey’s daily talk show ended. I’m sure many viewers miss the show, but for viewers, the main impact is that the show no longer beams into their living rooms. Fans of Winfrey’s work still have her brand new network (OWN) where they can get their Oprah fix. From this back in the day…..
I’m seeing a few more tangible repercussions of the end of Winfrey’s show up close. Why? Well, I live a stone’s throw from Harpo Studios here in Chicago. And those studios? They’re virtually empty, and that worries me. There’s been almost no activity there, save for the period when Rosie O’Donnell’s blink-and-you’ll-miss-it talk show was in production there for five months. Hundreds of former Harpo staffers have been laid off. Listen, businesses change and grow and relocate and are born and die all the time. I get it. And to be very clear: I do not have a chip on my shoulder about Oprah. I like her. I have some mixed feelings about how her show evolved over the years, but it had some great moments and affected a lot of people in very positive ways. I watched many episodes of Oprah and have no shame in my game about doing so. This isn’t about her. It’s all about my ‘hood, you see. When my partner and I first moved to the West Loop (a few blocks away) we were renters. Now we are homeowners. We’re invested in our home, our street and our neighborhood. This sign was up for about a minute last year. The fact that one of our neighbors’ homes, so to speak, is primarily a big empty shell is cause for concern, if not alarm. It’s not just the actual Harpo Studios building, which used to be an armory and takes up a whole city block with Washington on its south, Aberdeen to its west, Randolph to its north and Carpenter at its east. 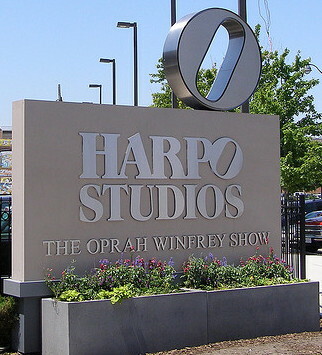 There are also other buildings adjacent to the studio that are used by Harpo – I can count at least three other buildings in the same vicinity where Harpo staffers are located. I hope Harpo has a long, sustainable life, but if it folds – or moves completely to California, where Winfrey herself is headquartered – that’s a huge chunk of our neighborhood to lose what was a solid economic engine. 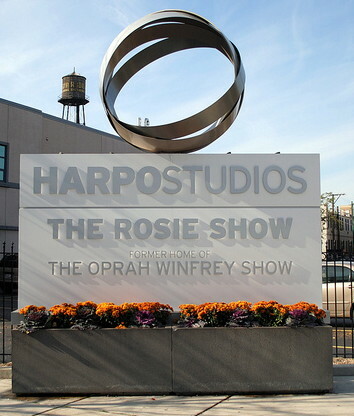 Oprah’s arrival is often heralded as the beginning of the renaissance for the West Loop, but the neighborhood would probably survive a drastic change if Harpo leaves. Restaurant Row is a bustling thoroughfare, with restaurants by Stephanie Izard and Graham Elliot Bowles dotting the Randolph Street landscape. 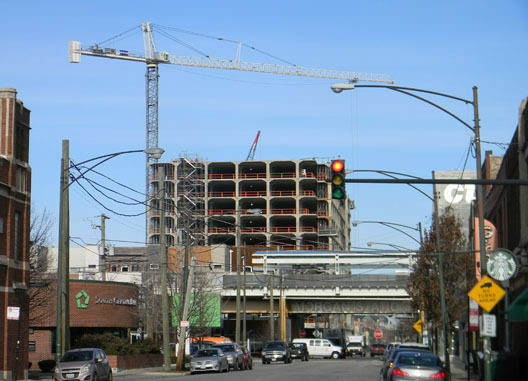 And in just the last few years, the Fulton Market neighborhood has exploded. But it’s foolish to think there will be no impact. Already Washington Avenue east of the studio has seen several businesses (including Le Peep) close due to the loss of Harpo-related business. I’ve seen a small spike in vandalism in those blocks, and it’s hard to tell at this point whether that’s just a summer-related spike or a more long term effect, but it’s troubling. More puzzling is why Harpo hasn’t actively marketed the space as a usable, turnkey-ready studio space. I posted about the possibilities of this space for a film or TV show recently. Steve Harvey’s new talk show was announced, but instead of using the Harpo space, a huge new studio has been built for him. I can understand a talk show host not wanting to follow in Winfrey’s shadow, but there’s been radio silence as to whether any other productions might use the space. Winfrey is known for holding her cards close to her vest and limiting information about her plans (three words: employee non-disclosure agreement), but I wish that she or her team would take a moment to sit down with residents and tell us what their plans are. Or if they have any long term plans at ALL for the space.